The stuffed animal storage organizers create a magic room that can turn the mess of the plush toys into a fashionable lazy chair. It's not only a perfect solution for your kids stuffed toys.you can also use it as a comfortable bean bag chair at the same time. An ideal place for you and your childrens. SHIP BY USPS,7-15 DAYS.This holder will transform the stuffed animal clutter into functional storage that works just like a bean bag chair - ideal for reading, snuggling, lounging or simply flopping on. 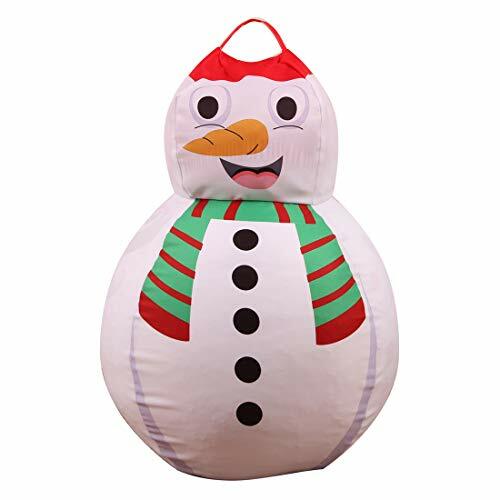 Snowman Total Height--31.5 inches/ 80cm.Body dia-26 inches.Made of polyester in stylish designs with a durable metal zipper that is hidden.Durable handle lets them carry the stuffed bag around. Ideal birthday Christmas Halloween present for child of any year - boy, girl, toddler, teen. Add color, character and a touch of organization to the nursery with a Famyfirst toy storage bag chair cover. Explore the many uses of our lounging pouf today. Use it to store toys, declutter the bedroom, hide the floor mess in a heartbeat and carry towels or pillows. Use the top hanging loop to facilitate carrying or storage! It can store kid's plush toys or stuffed animals as well as extra pillows, blankets, linens, towels, or comforters; when filled, it becomes a relaxing and enormous floor chair for sitting, reading or watching television. View More In Game & Recreation Room Furniture. If you have any questions about this product by Famyfirst, contact us by completing and submitting the form below. If you are looking for a specif part number, please include it with your message.